portray his talent for woodcraft and reflect his inspiration by the vineyards and wineries surrounding his families’ small ranch in Sonoma County. Each product in the Bella Barrel line is handcrafted by Jonathan in his woodshop surrounded by vineyards located in the heart of Valley of the Moon , CA. All of the wood pieces are made completely out of the beautiful American and French Oak, used in wine barrels. 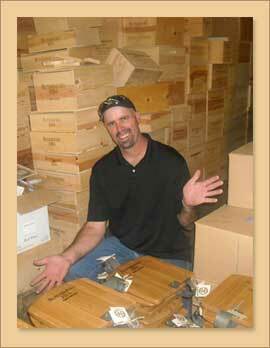 Jonathan’s goal is to build distinctive, unique, high quality wood products for the wine enthusiast. Every piece will be a conversation piece at home or in a winery. Unlike most wine barrel wood products that are on the market, Bella Barrel products are not sold unfinished and are 100% made from the parts of each barrel. Each piece is made from quality materials with the highest standards. Every wood product goes through four stages of sanding and application of the best of stains, protective finishes, glues and hardware. with a real passion and love for what he does. Jonathan grew up in Sonoma County in the heart of the Valley of the Moon, California. His life experience in the wine country is where he draws inspiration for the design and style of his wine barrel furnishings. Jonathan believes in traditional furniture building methods to achieve a craftmanship, look and style, of quality heirloom furnishings. Jonathan has devoted a substantial amount of time developing products that are fresh and new to the wine country.